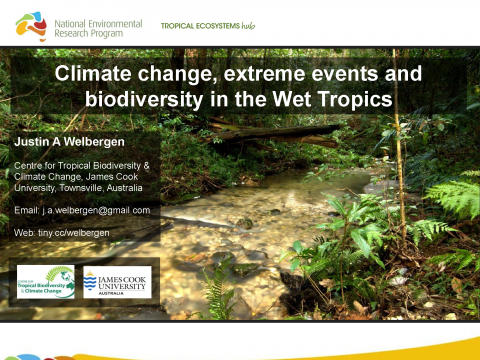 Justin Welbergen (JCU); Climate change, extreme events and biodiversity in the Wet Tropics; Tuesday 7th May 2013. 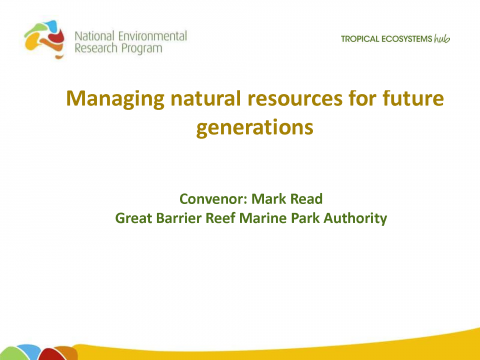 Mark Read (GBRMPA); Managing natural resources for future generations; Wednesday 8th May 2013. 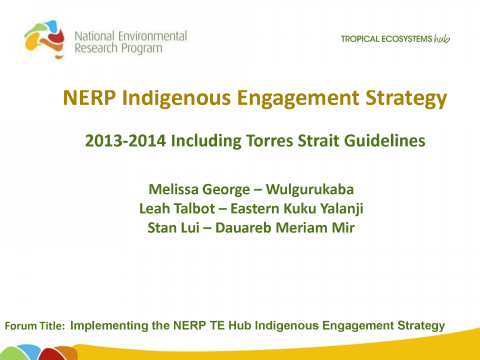 Melissa George, Leah Talbot, Stan Lui; NERP Indigenous Engagement Strategy - 2013-2014 Including Torres Strait Guidelines; Tuesday 7th May 2013. 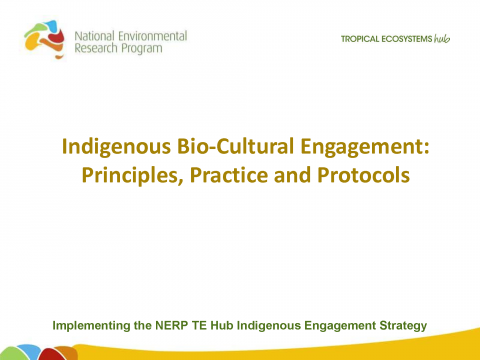 Melissa George, Leah Talbot, Stan Lui; Indigenous Bio-Cultural Engagement: Principles, Practice and Protocols; Tuesday 7th May 2013. 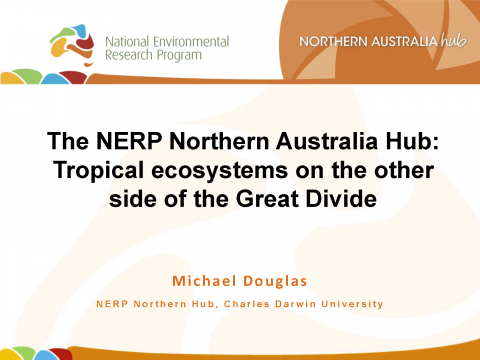 Michael Douglas (NERP Northern Hub); The NERP Northern Australia Hub: Tropical ecosystems on the other side of the Great Divide; Tuesday 7th May 2013. 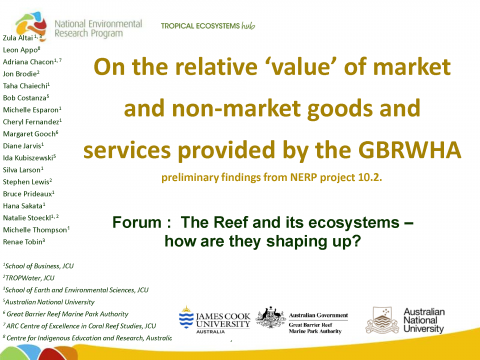 Zula Altai (JCU), Leon Appo (ACU), Adriana Chacon (JCU), Jon Brodie (JCU), Taha Chaiechi (JCU), Bob Costanza (JCU), Michelle Esparon (JCU), Cheryl Fernandez (JCU), Margaret Gooch (GBRMPA), Diane Jarvis (JCU), Ida Kubiszewski (JCU), Silva Larson (JCU), Stephen Lewis (JCU), Bruce Prideaux (JCU), Hana Sakata (JCU), Natalie Stoeckl (JCU), Michelle Thompson (JCU), Renae Tobin (JCU); On the relative ‘value’ of market and non-market goods and services provided by the GBRWHA; Thursday 9th May 2013. 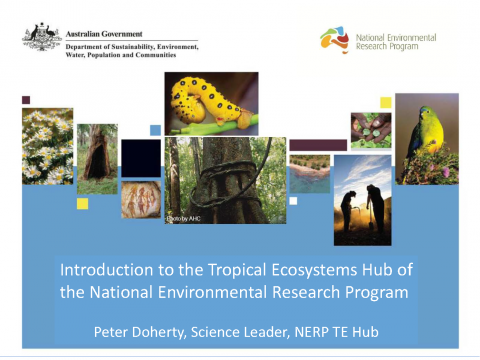 Peter Doherty (AIMS); Introduction to the Tropical Ecosystems Hub of the National Environmental Research Program. 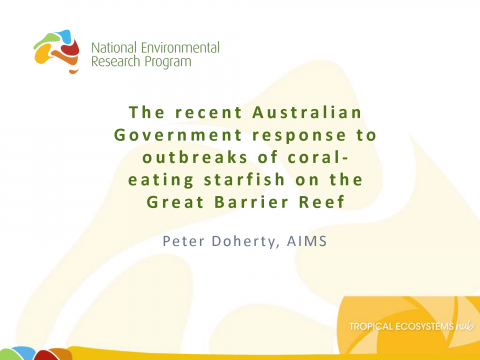 Tuesday 7th May 2013. 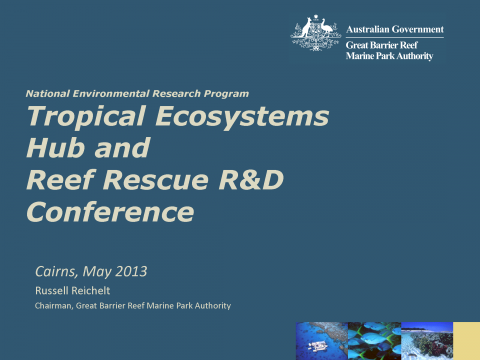 Russell Reichelt (GBRMPA); National Environmental Research Program Tropical Ecosystems Hub and Reef Rescue R&D Conference; Tuesday 7th May 2013. 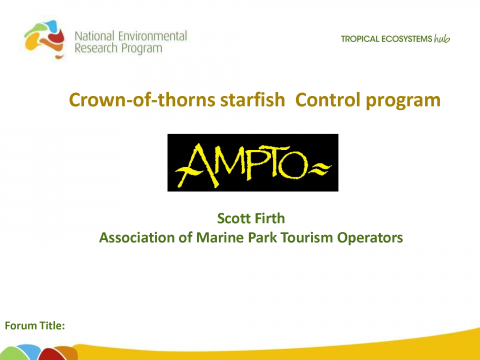 Scott Firth (AMPTO); Crown-of-thorns starfish Control program; Wednesday 8th May 2013.